Once, in the eighties, when paint effects were all the rage in Clapham, London, I decided to paint a “marble effect” on our white, wooden fireplace. During preparation I scraped off a little of the white paint – and guess what I found? Yes. A marble fireplace. During the 1960s the previous owners had painted over the “old fashioned” Victorian feature. This post is about enhancing what is beautiful rather than suppressing and recreating it. It is a fact of life that, over time, white hairs start to sprout on our heads, gradually replacing the pigmented ones, until in old age our hair appears to be largely colourless or white. 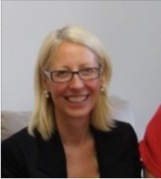 In the meantime the natural colour of the hair gets lighter as white hair gradually becomes more prominent. As women and men get older their skin and lips too lose some of their pigment too – and of course wrinkles, discolouration and degradation occurs. It strikes me that, somehow, our hair which matches our other colouring, carries on matching our other features. So changing the colour of the hair, especially when done crudely, immediately strikes me as unharmonious. The older the person, the more the shock. 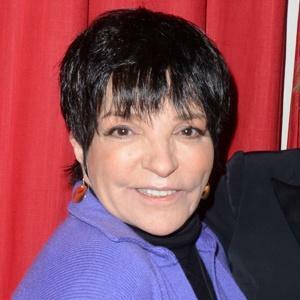 Here is 67 year old Liza Minnelli. Her hair is shiny and has been professionally coloured, but without a version of her Cabaret hair she would be unrecognisable. But actually a softer shade would look better. On older women relying on the services of “Hairport” in Stockport, or Boots Raven in their own bathroom, the colour will not make them look younger. It will actually age them. The shocking effect is caused by the harshness and unnatural nature of the shade, and it will emphasise the paleness of their skin, dark circles and other imperfections. Many of us associate blondeness with youth – after all lots of white British kids are blonde. 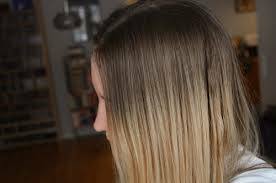 But the universal tendency of young women to bleach their hair as it gets naturally darker is creating a generation of look alikes. Then dying becomes a habit and before you know it you are 40 and still slapping on the bleach. It now looks brassy and you can’t really see it because you are used to it. But it doesn’t suit your skin tone anymore and it just looks like you have something nasty clinging to your head. I know because this was me. I dyed my hair from around 16 until I was over 50, and it really isn’t the best look for me. Also in a black jacket and glasses….hmm. The ability to bleach hair – mixing ammonia with hydrogen peroxide – was discovered in the 1930s although the techniques were somewhat primitive and users often incured burnt scalps. This was a high maintenance looks for the Platinum blondes of the Silver Screen. Such was the demand for the look that the chemists of Europe and America invested in the technology of bleaching and dying so that by the time Gentlemen Prefer Blondes was released in 1953, and by then you could buy home dye kits which is when it all took off. Apparently over 90% of American women have dyed their hair at some point. In the States less than 10% of women are naturally blonde – and around 12% of the world population, but blondes are the best selling hair colours in the US. Followed by the reds, whereas only 1-2% have naturally red hair. Although over time obviously dyed hair has become fashionable, with youngsters even choosing grey over the last few years, initially the idea was to look natural and younger. I love grey hair on both men and women, and it can look very intriguing. But of course greying hair is one of things we associate with ageing. The fact that 50 % of UK women dye their hair is largely due to this natural loss of pigment as the years go by. 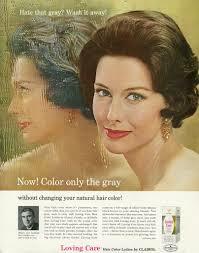 So to some extent it is true that covering up the grey can help you look younger. The problem is that most products and shades chosen make your hair look inauthentic, like you have something to hide. I am sure you will be able to tell if someone colours their hair – the colour looks false and this ages people. If you decide to dye your hair go for a slightly lighter shade of your natural colour. Your natural colour with some lightness in it (this is what greying actually is – white hair gently blended into your natural colour). 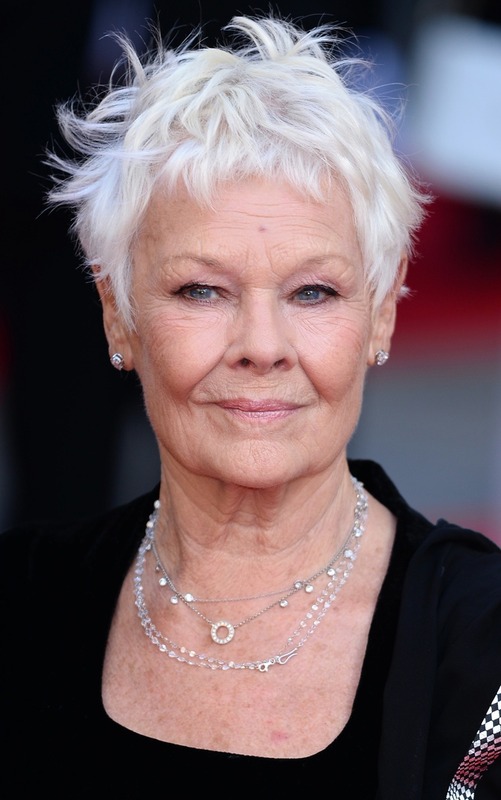 Here is a gallery of inspirational grey haired ladies – some of them are famous, some are just beautiful. The bottom three are a) a lovely NHHT tenant, b) Patrica, the wife of an old friend Kirk, and c) Judy Buckley, another dear friend. If you want to try this look it does require some commitment. My preference is Cold Turkey. Abstinence. Just stop colouring your hair. You will get grey/natural roots in around six weeks from Decision day. They will look horrible and may tempt you back to the dye.When the roots first start showing you can disguise this with an Alice band or scarf for a while if it bothers you. If you can resist in around three months you will have more natural hair (ie one and a half inches). From now on it will appear that you have chosen the Ombre look, and it won’t be so bad. Get your hair cut – getting rid of as much of the old colour as you can – and keep this up regularly until your hair dresser tells you that you are now dye free. Once there is significant new growth it will have the effect of flattering you because it is actually the hair that is near the face that matters in terms of colour. It doesn’t look too bad and you can now consider a shorter style. I reckon it takes around two years to achieve. There are some people who say dye your old hair close to your natural colour first so the new growth line is not so harsh. As can be seen from the picture above, with growth the line blends anyway due to the differential rate of growth of your hair. That harsh line you spotted at the scalp has gone. The problem with putting hair colour on is that you cannot get a good grey anyway. And all hair “colour” includes bleach (hydrogen peroxide) even if it is advertised as Ammonia free. Even black hair dye bleaches your natural colour away first. So the colour you are putting on starts by taking away some of your natural colour. Its your choice but I would just stop using the products completely and give your hair a break. As you know, I agree. None of the women in my family have ever coloured their hair, other than my mother’s sister, so I have a great tradition to follow in remaining natural. 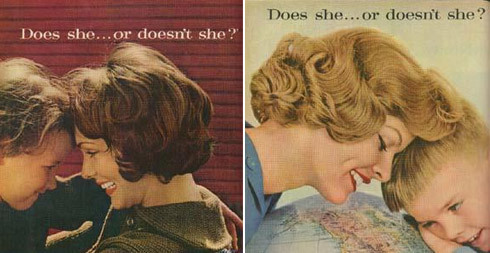 My mother was a beautiful strawberry blonde when she was younger, but in her late sixties has shiny, thick, silver hair and looks fantastic. She does power yoga – no need for hair colour to change how she feels about herself or her youthful vibe. She’s also always running around town doing volunteer work, teaching music and her crafts for fun, etc. I have always observed exactly what you suggest – that the difference between colour and skin tone is often very noticeable and serves to age an older woman, which is the opposite of what people are striving for. The people who I think have the most difficult time are the ones who try to maintain the colour of their youth, especially when their hair was quite dark. It just doesn’t tone well with the rest of their looks. I know two women in their late forties who look good with their coloured hair, but they spend an awful lot of time and money doing it. For me, that would be a big obstacle – I hate sitting in the hairdresser’s chair as it is, so the idea of going every few weeks to sit as chemicals are slathered on me gives me the shivers! In fact, I have never used many cosmetics and have gone chemical-free in recent years. I use a natural shampoo and moisturizer and nothing else, other than my one exception to my general chemical-free-ness: mascara (I haven’t found a natural one I like). I think it just makes sense to only put things on your body that you would also put in it, and also to not send additional chemicals down the drain. It’s a huge bonus that I also think it looks better to be natural! I think it’s something that as a culture we need to think of, because in almost all cases the pursuit of beauty with product only obscures the beauty that is already there and also does damage on a lot of levels – from creating insecurity in younger women as they chase unattainable beauty ideals to creating a great deal of needless waste. I think if more older women show an example of being comfortable in their own looks and relishing their uniqueness, this will do a lot of good in generating a younger generation more confident in their natural endowments. I agree with you that hair colour looks more natural, whether dyed or not, when it harmonises with skin tone, but it’s not easy to be objective about how we look, that’s why we need stylists, colourists and thought provoking blogs like this. I also think that many statement ‘greys’ may enhance their colour, so I wouldn’t say that being grey is necessarily a natural look, but it even so it would be working with, and not against, what you already have. I take after my paternal grandmother who had mostly dark strands in her greyish hair well into her 70s, it’s not a look I’ll be embracing. Nor could I I carry off silver either with my sallow complexion. I don’t want to be too dark as that looks all kinds of wrong now, so for me the issue isn’t whether to colour or not but how to improve my look and that is entirely subjective. So I say, don’t fight nature but by all means enhance it, if you want colour get good advice and the best you can afford, it’s not so different from wearing make-up to look better, perhaps less is more as you age, but no need to go barefaced! Annie makes some good points here. I am always interested to hear other women’s thoughts on the subject. I greatly appreciate this post. It is something I really want to embrace but I’m afraid, which I hate. I love how beautiful all the women you show in this post, they are really stunning. Liza is the only one that stands out as a miss. I hate that where I live youth is everything and aging is something you ignore, hide, or run away from. I actually really love being the age I am and feel best about myself right now. I need to think about this more and may need more encouragement. I think I’m between mousy brown and gray…not the best combo platter.